Financial Planning is the process of channelising financial resources towards financial goals. Resources include inflow generated through human capital (earning members of the family), financial capital and real capital (investments into equity, debt, real estate, bullion, etc.). This stage deals with protecting wealth. Wealth includes both non-material and material wealth. Non-material wealth consists of you and your near and dear ones. On the path to achieving goals, there could be instances of job loss, migration, illness, disability, accidents, and death. We need to have a strategy to deal with these eventualities. Though the emotional pain can take long to come to terms with, being at our wits end can be of huge help. In order to mitigate financial stress, structured planning is vital. This kind of backing gives us confidence on a rainy day and prevents us from acting out of fear, impulse or pressure. Protecting material wealth is also important. This consists of a house, an office, a shop, other real estate, a car or other vehicles of transport, jewellery, etc. They need to be protected from fire, theft, burglary, cyclone and many other perils. Lastly, you need to protect yourself from liabilities as well, e.g. If a maid servant gets an electric shock while working in the house then the expenses have to be borne by the employer. The employer becomes liable to pay for her. 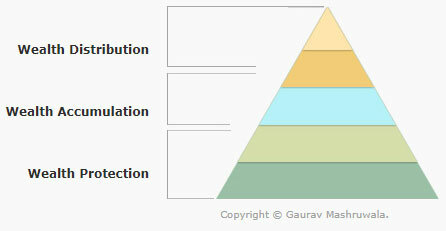 All these can erode wealth and hence a wealth protection strategy is the first step in any financial planning process. 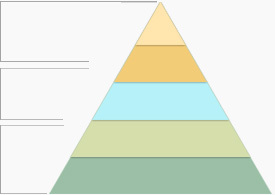 After wealth protection strategies are in place, the focus should be on accumulating wealth. One of the biggest hurdles in wealth accumulation is borrowing. Further taking a loan on one hand and making an investment on the other hand is like pouring water into a bottom less jar. Irrespective of the amount of effort put in, you cannot succeed in filling the jar up. Therefore, the first step in wealth accumulation is to control debt. After paying off debts the focus then shifts on investments, based on the financial goals. Wealth accumulation is also the first step towards Retirement planning, a plan to ensure a good life even at your old age. Wealth Distribution begins with providing for the golden years of life. This is then followed by bequeathing assets to loved ones. The process of wealth protection, wealth accumulation and wealth distribution is applicable to all individuals irrespective of the stage of life and situation of the individual's life - be it in beginning of a career, immediately after getting married, joint family, recently separated, single parent, at the time of retirement or after retiring. Though starting early is best thing to do, it is never too late to start planning. Dealing with catastrophes, both natural and man-made with equal ease. Accumulating Wealth for future financial responsibilities. Bestow your wealth to your close kin. Financial planning provides direction and meaning to financial decisions. It allows you to understand how each financial decision taken affects other different areas of your finances. For example, buying a particular investment product might help you pay off your mortgage faster or it might delay retirement significantly. By viewing each financial decision as a part of a whole, you can consider its short-term and long-term effects on your life goals. You can also adapt more easily to life changes and feel more secure that your goals are on track. You do not possess expertise in certain areas of handling finances. A planner can help you evaluate the level of risk in your investment portfolio or adjust your retirement plan due to changing family circumstances. You want a second opinion on the financial plan you have developed, to give you confidence in the viability and expected success of the plan in achieving your goals. You don't have time to spare for your own financial planning. You have an immediate need or an unexpected event has occurred that requires you to start planning, such as, birth of a child, inheritance or major illness. You feel that a professional adviser could help you improve the way in which you currently manage your finances. You want or feel the need to improve your current financial situation but don't know where to start. You find it difficult to stick to a plan. Some personal finance software packages, magazines or self-help books can help you do your own financial planning but they are usually generic in nature. Understand the effect of each financial decision. Re-evaluate your financial situation periodically.